Normalisation of sFLCs after induction was associated with improved LCMM clinical outcome, but a negative UPE/uIFE was not . The IMWG recommend further study of Hevylite in MRD assessment, as a marker of tumour eradication and immune system recovery . The IMWG recommend sFLC analysis as part of a panel of laboratory tests for the diagnosis of RI in patients with MM . It should also be performed at disease assessment. Dimopoulos MA, et al. International myeloma working group recommendations for the diagnosis and management of myeloma-related renal impairment. J Clin Oncol 2016. English guidelines recommend SPE and sFLC analysis to screen for a monoclonal protein in patients with suspected myeloma. 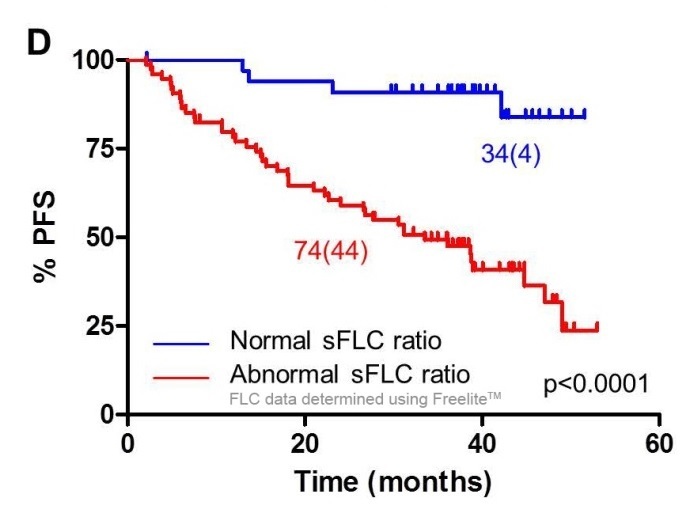 At myeloma diagnosis, the sFLC ratio should be used to assess prognosis . Myeloma: Diagnosis and management. NICE Guidelines 2016. Over the past twelve years, there have been seven editions of the monograph entitled, Serum Free Light Chain Analysis (plus Hevylite). With the ever expanding literature on serum free light chains and Hevylite, each new edition of the book quickly becomes out of date. Hence, Wikilite.com, an online resource in which the hundreds of new publications are reviewed and rapidly integrated into a changing and challenging subject. All are familiar with Wikipedia. It has some superb features such as a great search engine, hyperlinks with the literature, and an escalating data base. Furthermore, it can be accessed by all without the need to destroy a rain forest. This format seems to be an ideal way to present the latest information on Serum Free Light Chain Analysis plus Hevylite. Wikilite.com is available on a read-only basis. The revision process involves a team of clinical and scientific staff at Binding Site working together to provide updates on their specific areas of expertise. There is also a chief editor who provides consistency of content and style and monitors updates on a continuous basis. In this manner, we intend to maintain a fully up-to-date literature review for all those who are interested in Serum Free Light Chain Analysis and Hevylite. Unless stated clearly to the contrary, all quantitative serum free light chain data within Wikilite has been generated using Freelite® kits manufactured by The Binding Site and all guidelines and proposed clinical utilities have been based upon Freelite data. In some countries, products intended for measurement of serum free light chains, have been made available by other manufacturers. Trials of such products have produced poor correlations with free light chain concentrations determined using Freelite. Therefore, it cannot be assumed that other products will have the same clinical utility or give compliance with current guidelines, such as those issued by the International Myeloma Working Group (IMWG) and the National Comprehensive Cancer Network (NCCN).